This small indie game could be the Xanax of VR. It's fitting that the morning I first experienced Deep VR at the Tribeca Film Festival, billed by its creators as a meditative virtual-reality experience, I was already approaching peak anxiety levels. At 9:30 a.m., I was behind schedule (for reasons beyond my control) and huddled in a claustrophobic installation space made all the more overwhelming by various camera crews and the booming soundtrack of a heartbeat from the far corner. So when I first strapped the HTC Vive onto my head and a snug-fitting sensor around my diaphragm, I braced for the worst, assuming I'd be hit with a wicked bout of VR sickness. How wrong I was. Guided by a circular reticle that expanded and contracted along with the movements of my diaphragm, I floated gracefully through a Tron-like underwater world shaded by cool blues, cheerful pinks and relaxing purples as low-poly models of marine life swam about. It took only about 10 seconds or so for the game's breathing-based control scheme to become intuitive, at which point I'd become so engrossed in gliding through the environment and surrendering my mental state to the fuzzy murmur of binaural beats soundtracking it, that I'd forgotten about Tribeca and the media frenzy around me. In truth, I took off the headset only because I knew I had to make way for other journalists, not because I was ready to end my play session. When I did, Owen Harris, the video game designer who originated the concept for Deep VR, was delighted: According to Harris and his Dutch co-creator, Niki Smit, I'd officially stayed in the experience longer than any other viewer who'd demoed it. "We want to help teach people these breathing techniques so that they can then manage these conditions outside of the game," says Harris of Deep VR's intended stress- and anxiety-reducing goal. "This is a technology that exists within all of our bodies that costs no money [and] that we have all have access to." Deep VR's therapeutic properties are no accident. Harris originally developed the game as a concept for Oculus' first development kit, the DK1, seeking an escape from depression and the personal and professional stresses he was experiencing at the time. Back then, Deep VR was merely a crude proof-of-concept lacking in an appealing visual design, binaural beats, deep breathing modeling and color psychology. "When Oculus finally arrived, I was just really excited about building spaces to just be in," says Harris. "Spaces that were just kind of outside of this world. So the first things that I was building were simply star fields and spacescapes to meditate in." Soon enough, though, Harris realized he could build out the experience by incorporating deep breathing exercises. Both Harris, who's based in Dublin, and Smit, who handles the visual design and hails from the Netherlands, owe Deep VR's evolution (and their long-distance partnership) to one person in particular: Paulien Dresscher. It was after a serendipitous meeting with Dresscher at an expo for interactive visual and performing arts, where Harris had shown off an early version of Deep VR, that he was put in contact with Smit. Dresscher, who heads up the MediaLab at Cinekid, a Dutch media festival focused on children, had remembered a meditation-focused game about "being a tree," called Bohm, Smit had created several years earlier. She insisted the two get in touch over Skype, and the rest was VR kismet. Harris' early conversations with Smit helped shape Deep VR's polished look. But the demo shown off at Tribeca is only a preview of what the pair have planned. 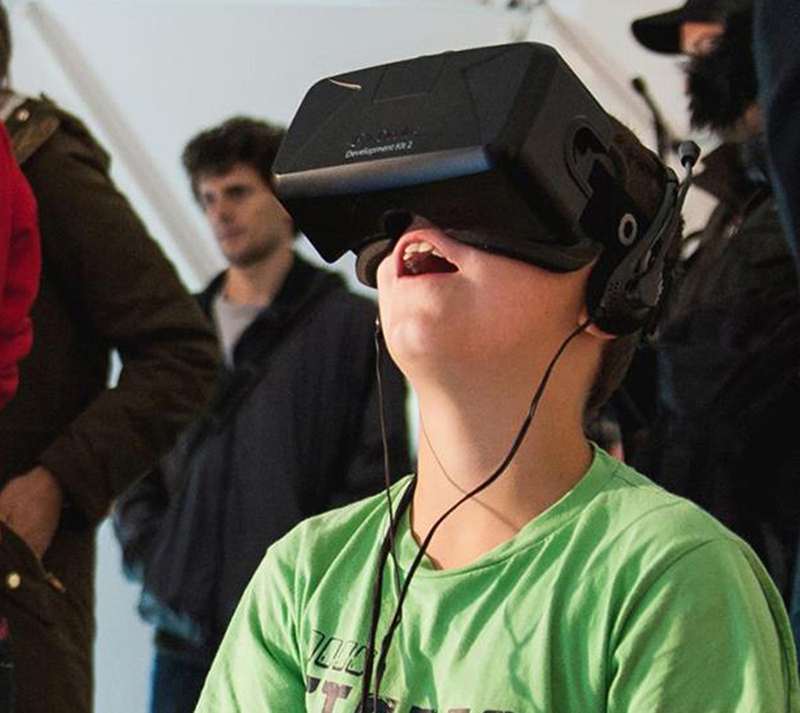 Through a partnership with Isabela Granic, a professor of Behavioral Studies at Radboud University in the Netherlands, Deep VR will become more than just a calming escape for VR enthusiasts; it's now the basis for a psychological study that aims to alleviate anxiety in children. Though Harris and Smit hadn't consulted behavioral researchers during the initial design phase of Deep VR -- they did, however, make great use of Google -- Granic says the duo's work was scientifically sound. "They nailed it so beautifully," says Granic of Deep VR's skillful use of sound, color and breathing techniques. With a yearlong grant to fund her research, Granic's already completed a pilot study on a group of more than 100 young people (ages 8 to 20) comparing the relaxation effects of Deep VR and exposure to scuba diving videos. She says the early findings will be presented at CHI 2016, a leading computer-human interaction conference. But Granic's involvement with Deep VR will extend beyond just using the game in controlled studies. Her findings will also inform future iterations of the game's design and, eventually, its sensor. Deep VR will become more than just a calming escape for VR enthusiasts; it's now the basis for a psychological study that aims to alleviate anxiety in children. Granic says the research and development-based process will move forward in two phases: The first will involve modeling, or the ability to use subtle design cues to teach deep-breathing techniques. Work on this phase has already begun and will see Deep VR include animals for the viewer to follow that ascend and descend in accordance with necessary deep breathing rates. In essence, their movements will show the viewer how to breathe and relax. The second part of the study will fold exposure therapy into the mix, an addition that will shift the overall tone of Deep VR from sedative to mildly and purposefully frightening. "When people are anxious, what you do is systematically desensitize them," says Granic. "You bring them closer to the things they fear while they are being taught these deep-breathing relaxation techniques." Granic didn't specify just how this would manifest in Deep VR other than to say these elements would be scary but ultimately therapeutic. Granic's academic hand isn't the only guiding force shaping the future of Deep VR. Harris and Smit say they intend to evolve the game's visual and aural design. They want to make the game's soundscape more interactive so specific environments correspond to specific brainwave frequencies and ambient music. They also hope to nail down an affordable, consumer-ready sensor design that can be used as a controller for a variety of games and are considering a Kickstarter campaign to fund it. If Harris and Smit get their way, Tribeca will be the last festival stop Deep VR makes. The two are keen to release the game to Steam VR and other VR platforms sometime this year with all of the research-backed improvements they hope will have a "meaningful impact on people." "It's great to just have a conversation around mental health and the struggles that we all have with that," says Harris. "In my own country of Ireland, as well as all over the world, there's massive problems with that and yet people are still embarrassed or shy to talk about their own struggles. Every week we get emails of people sharing their stories with us and how they're excited about us being able to bring this game so that they can see if it has an impact on their life in the same way it's had an impact on ours."